For a gift that lasts forever, buy a diamond. The glittering gems have been favorites of women everywhere for centuries. 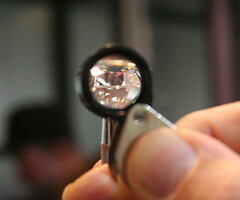 In the last 50 years, new technologies and innovations have taken the diamond market by storm. To ensure that you are getting a real diamond, you need to follow a few simple tips. From visiting a trusted jeweler to looking for certification, you can make sure that your diamond is the real deal. As a child, you probably noticed the rainbows that streamed out of your mother’s ring. These rainbows are caused by the refractive index of the diamond. Some stones like quartz or glass also have a refractive index, but their index level is much lower than a diamond. A true diamond will sparkle and bend light. To test the diamond, try to read a newspaper through the stone. Before you do this, flip the diamond upside down. If you can read through the upside down gem, it most likely is not a real diamond. If the diamond has already been mounted within its setting, look down from above. You will not be able to see the bottom of the gem if it is a real diamond. The only thing you need to watch out for is a double refraction. Some high quality fakes made of silicon carbide will actually produce a double refraction. Try weighing out the stone. One of the top forms of fake diamonds is made out of cubic zirconia. If a diamond and a “diamond” made of cubic zirconia were made to identical cuts, the cubic zirconia would still way 55 percent more. If the gem stone you are looking at weighs more than it should for its shape and size, it may not be real. Actual diamonds are known for their amazing ability to quickly disperse heat. If you are uncertain if the stone is real, press it against your mount and gently blow on it so the stone fogs up. A real diamond will instantly disperse any of the heat so you will not see any fog. By the time you get a chance to look at it, a fake diamond will still have some fog on it. As you blow, condensation will begin to build up on the fake stone while the real diamond will continue to be crystal clear. Another top simulated stone is called Moissanite. This popular simulated diamond can be detected using a special Moissanite Tester. The testers are available online and in stores to help buyers find out if their diamond is real or not. If the diamond is real, the stone is not going to be set in cheap metal. Look at the stamp on the metal. If it says 10K to 24K, it is some kind of gold. Numbers like 585, 750, 900, 950 or PT generally refer to some kind of silver or platinum metal. If the diamond is stamped CZ, it is not real. CZ stands for cubic zirconia. If your diamond says this, it is not real. The easiest way to ensure that you get a good deal on your diamond is to go to a reputable seller. Only buy diamonds from a website or jeweler you trust. Modern diamonds will come with their own certificate of authenticity. To ensure the safety of the stone, modern diamonds will often have a code inscribed in minuscule writing. If your diamond is from a reputable dealer, has the code and the certificate, chances are that you are most likely dealing with a true stone.